Winter crop growth has been very slow in past two weeks and crop development is slightly later than normal, according to Teagasc’s latest crop report. It says wheat is at Growth Stage (gs) 32-37 with flag leaf peeping in advanced crops. 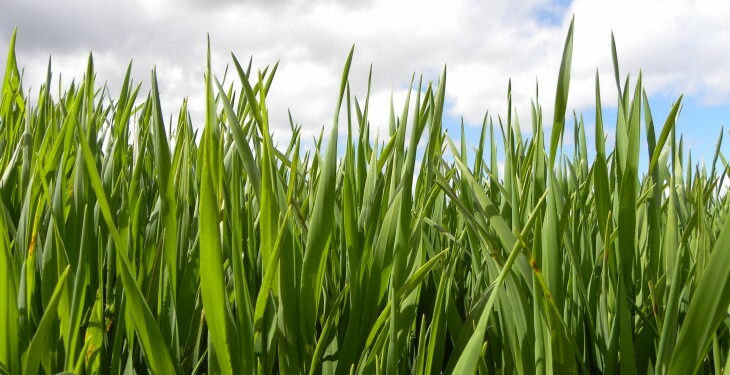 Teagasc says most winter barley crops have awns emerging while the flag leaf is appearing on oats. It also says disease levels are expected to increase with the recent rain. Meanwhile, spring cereals are growing slowly due to the lack of mild, warm weather since they were drilled. Growth has been slow in past two weeks, with most crops varying from 2nd node (gs 32) to flag leaf peeping (gs 37). Septoria levels have visibly increased with active lesions on leaf 4. 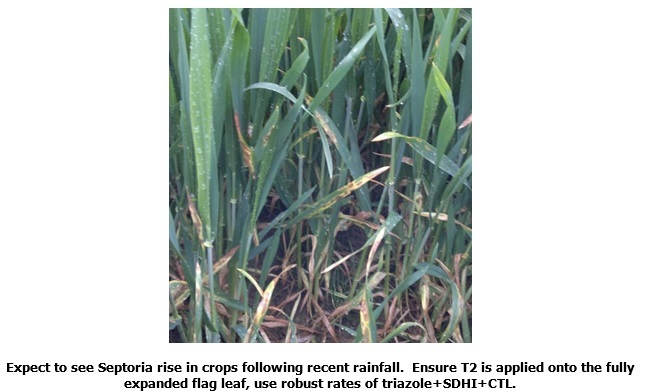 The T1’s, where applied onto a fully emerged leaf 3 and part of leaf 2, would be expected to give good protection. Delay the T2 until the flag leaf is fully emerged. Crops growth stages range from flag leaf fully out to headed out. All crops will be fully headed in the next week to ten days. Disease levels are rising, with two row barleys showing higher levels of Rhynchosporium. 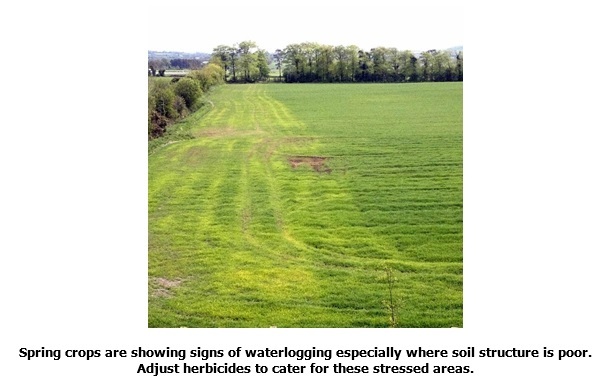 Blotching is also evident in crops, most likely due to cold conditions and agro-chemical applications. Most crops are at gs 33 to 37. Disease levels continue to be low but watch out for rising mildew levels, as unsprayed plots have a lot of mildew in Kildalton. In general, winter oats looks to have good potential this year; however some advisors have reported uneven crop growth from suspected nutrient deficiencies. Crops are at mid-flowering to late flowering with cold weather prolonging flowering. A second sclerotinia fungicide is only recommended in high risk situations. Spring cereals are tillering at present (gs 21-25) with some advanced spring barley crops approaching stem extension (gs 30). The recent wet weather, although needed to activate fertiliser and even up germination, has showed up compacted and wet areas. 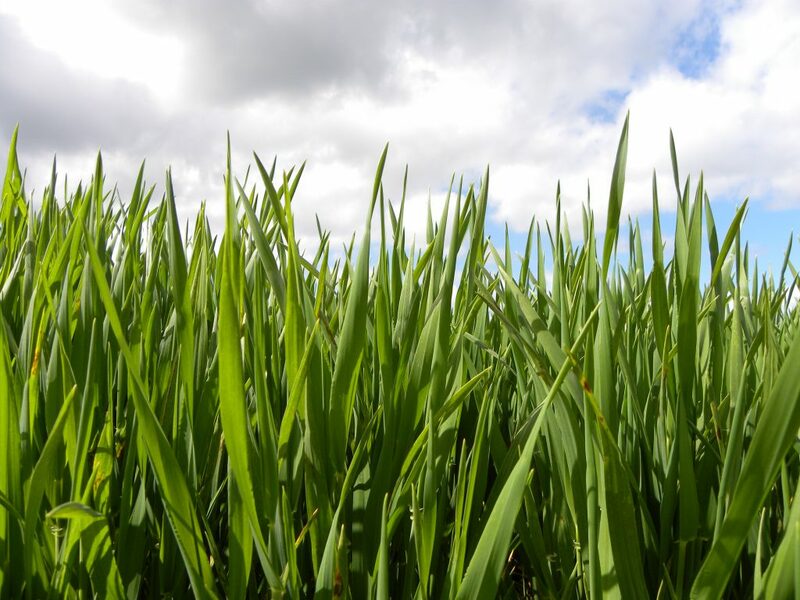 The majority of spring cereals have yet to receive their herbicides and strategies may need to be adjusted to correctly time wild oat herbicides and first fungicides. Covered maize crops are just breaking through the plastic, while early drilled crops in the open are just emerging. Teagasc/UCD recently ran maize seminars; the proceedings can be viewed on the Teagasc website. All beet is planted. Emergence is slower and more uneven this year due to cold conditions. Earlier sown crops were scorched by frost. Careful assessment is required to assess populations and when herbicide applications should begin. Over 65%- 70% of main crop potatoes are now planted however there is up to 40% later ground in the north east and north west is still to be planted. There were reports of frost damage in the north east but less so in southern counties. 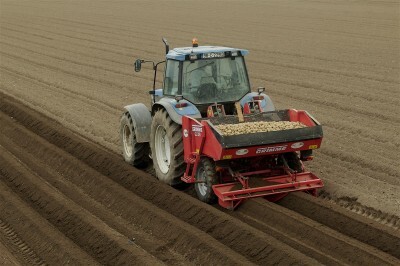 The first early potatoes are expected in early June.